Approximately 20 percent of all human cancers have mutations in a gene called KRAS. 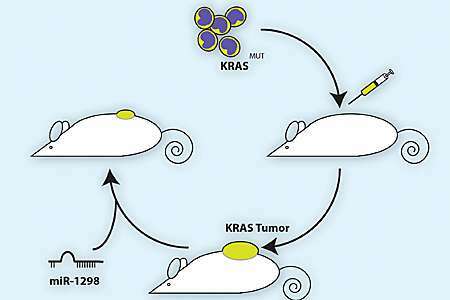 KRAS-mutant cancers are among the most difficult to treat, with poor survival and resistance to chemotherapy. Researchers at University of California San Diego School of Medicine and Moores Cancer Center used microRNAs—small pieces of genetic material—to systematically inhibit thousands of other genes to find combinations that are specifically lethal to cancer cells driven by a KRAS mutation. "For decades researchers have tried to directly inhibit KRAS activity, but there are no well-defined binding pockets in the protein that we can target with small-molecule drugs," said senior author Tariq Rana, PhD, professor of pediatrics at UC San Diego School of Medicine and Moores Cancer Center. "Instead of trying to deter KRAS itself, we took the approach of looking for other molecules that, when inhibited, are lethal to cells only when KRAS is also mutated." To do this, Rana and team used microRNAs, small pieces of genetic material similar to DNA. MicroRNAs don't encode proteins. Instead, microRNAs bind messenger RNAs that do encode proteins, inhibiting their translation or hastening their degradation. Normal cells use microRNAs to help control which genes are turned on or off at different times. MicroRNAs tend to be less active in cancer cells. In this study, the researchers created a library of more than a thousand human microRNA mimics, each with a different sequence and capable of binding different messenger RNA targets. First, they tested each microRNA on colorectal cells grown in the lab. Half the cells had a KRAS mutation that made the protein more active, as is the case in many cancers. The other half had normal KRAS. The microRNA sequences that killed only the KRAS-mutant cells were then tested again in a panel of lung cancer cell lines with and without KKRAS mutations. From this screen, one microRNA in particular stood out for its ability to suppress KRAS-dependent cell growth in both colorectal and lung cancer cells: miR-1298. MicroRNA-1298 inhibits two proteins in cancer cells, FAK and LAMB3. When the researchers silenced either of these proteins, they saw the same effect as adding miR-1298—KRAS-driven cancer cells stopped growing. "This clinical finding suggests LAMB3 could be used as a prognostic biomarker, and underscores LAMB3's potential as a therapeutic target for KRAS-driven cancers," Rana said. "What's more, it highlights miRNAs as important tools for probing complex biological processes, identifying new therapeutic targets and developing potential new RNA-based therapeutics."